Discussion in 'RGB Lights - Intelligent Pixels and 3-Channel RGB' started by zman, Dec 4, 2014. Anyone get Ray Wu's next gen TC's? Problems? I purchased 6 strings of 50 technicolor pixels in October. I used them to create 6 arches which played perfectly the saturday I put them up, but sunday we had over 2" of rain. Monday I fire them up to test them and every string had something wrong with them. I ended up replacing 1 - 2 bad pixels in each string by sacrificing one of the strings for parts. I had 10 sets of the black ones last year and all 10 sets failed. Ray didn't ship the replacements until the end of Oct, but I got all green this time. I've had them up on the house and running for a couple weeks so far and they were running from the time I took them out of the box until I put them up and haven't had a problem but we also haven't had any rain or large fluctuations in temperature. It is however raining as I type this so we'll see how things fare. My issues last year were primarily with the voltage regulators and those issues seem to be fixed. I have a set of the new technicolors, may get them out yet this season, but will make sure they are in the dry! I had bought some last year, but held off. Decided to use them around my driveway this year. Some had clear wire, and some were black wire ones. Ran great for a week then the clear string side started going crazy. Seemed to start at at a certain point, so I would replace a couple right at that point. Then it'd be down the string. Fix those, then it was back before the first splice. Don't know where the noise is getting in. Gave up last night and unplugged them all. 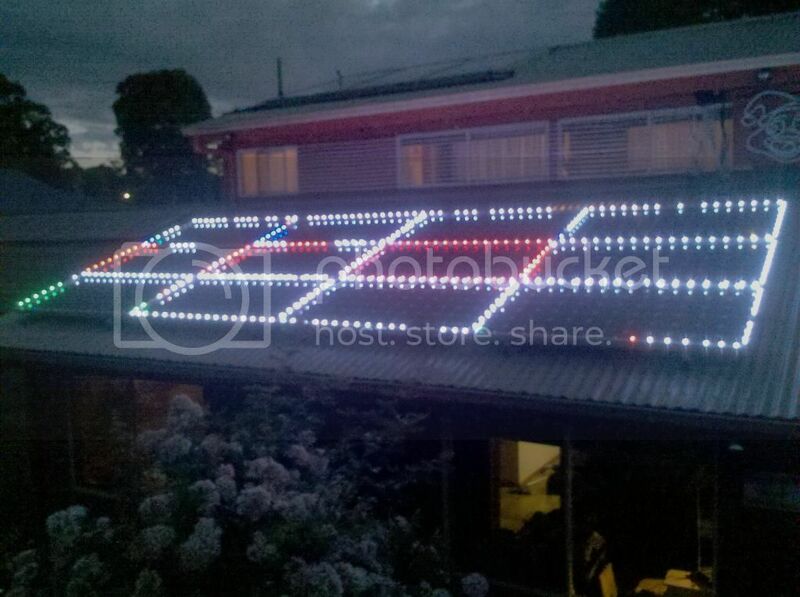 I have 6 strings on the new Technicolor pixles on my roof in a star outline. 2 strings get affected by moisture, and cause the rest of the trailing pixles to blink like crazy, 2 strings have a pixel with 1 colour missing. I used a further 2 strings of these technicolor pixles on my Merry-Go-Round, and have had no problems at all with these 2. I bought 7 strands of 100. All failed after the first rain. Does anyone know where the water is getting in on these? Results after rain. This is in test mode running a p12s, so you should see rgb and a white chaser. I would like to see if I can salvage any of the pixels, Where does the water get in? Thanks Louie. I was thinking the water must be getting in threw the led area. Looks like I will be playing with some silicon to try and fix it.